The Los Angeles City Council today approved a large mixed-use project designed by famed architect Frank Gehry that will replace an existing strip mall on the eastern end of the Sunset Strip. The project at 8150 Sunset Blvd., near Crescent Heights Boulevard and the border with West Hollywood, will rise on a site that now houses a shopping center with a bank, fast- food restaurants, a dry cleaner, ice cream shop and similar establishments. The project calls for 229 residential units of mostly apartments and 65,000 square feet of commercial space, with plans for a grocery store, restaurants and retail shops. The project has been controversial, with nearby residents expressing concerns over parking, rooftop sound, traffic, demolition of the Chase Bank building, which some see as having historical qualities and the initially proposed 16-story height of the apartment building along Havenhurst. The property is the site of the former Garden of Allah, the historic home in the 1920s through 1950s of actress Alla Nazimova and her friends. The City of West Hollywood also has expressed concerns about the impact of the project, including traffic and the city’s sewer system. Last week, during a session of the L.A. City Council’s Planning, Land Use and Management Committee (PLUM), West Hollywood Mayor Lauren Meister, Community Development Director Stephanie DeWolfe and attorney Beth Collins-Burgard worked out a handshake agreement with Townscape to scale down the project. Under the terms of that deal, the height of development’s tallest building, once proposed for 234 feet, will be reduced to 178 feet as measured from the lowest point on sloping site. The top floor of that building will have a 10-foot setback on its southern side (which faces West Hollywood) so that the building will appear less tall, and mechanical equipment such as air conditioning compressors will be moved away from the WeHo border. Townscape also agreed to give West Hollywood $2 million for traffic improvements. Meister indicated to WEHOville that the city plans to erect bollards at the city’s border along Havenhurst Drive (on the western side of the site) to create a cul-de-sac, similar to the cul-de-sac on Westmount Drive just above the Trader Joes grocery store. That cul-de-sac will prevent traffic leaving the 8150 Sunset project from turning left onto Havenhurst, thus preserving the residential street and thwarting Havenhurst from being used as a cut through street to Fountain Avenue. Townscape will also give the city more than $500,000 for sewer improvements, since the project will connect to West Hollywood’s sewers. The WeHo City Council agreed on the terms of the deal with Townscape at a meeting closed to the public. The Council also held an “emergency” closed session on Saturday at which it discussed the deal. It is not clear whether advance notice of that session was given to the public, as required by state law. As of publication City Attorney Mike Jenkins has not responded to a request made this weekend for comment on that. Townscape has been more directly involved with West Hollywood as the developer of the controversial 8899 Beverly Blvd. project in West Hollywood. That project required the City Council to approve almost doubling the size of a building that already was three times the size permitted in that zoning area. Townscape, a major contributor to the re-election campaign last year of John Heilman and to John Duran’s campaign this coming March, won the WeHo Council’s approval. The changes to the 8150 Sunset project met many of the demands made by City Councilman David Ryu, whose district includes the project, in a letter sent to the planning committee. The neighborhood surrounding the project includes the Chateau Marmont hotel, Granville Towers, Colonial House and other iconic Hollywood and West Hollywood residences that stars such as Clark Gable and Marilyn Monroe once called home. The L.A. PLUM decision did not include what to do about a request by local residents to preserve the Lytton Saving Bank building, which is on the construction site. PLUM members deferred a decision on that until late this month. In mid-September the L.A. Cultural Heritage Commission unanimously agreed to grant landmark status to the Lytton Savings building, which was designed by noted Southern California architect Kurt Meyer. Now a Chase Bank, the building with its zig-zag folded plate roof, glass walls and interior art work offered a radical architectural departure from traditional bank building when it opened in 1960. If PLUM agrees to designate the Lytton building as historic, the L.A. City Council must approve the landmark status before it becomes official. But if landmark status is granted, the Lytton Savings building can still be demolished, although there would be several extra legal steps involved before the wrecking ball could hit the building. Frank Gehry has noted that the Lytton Savings Building occupies a space where a construction crane must be placed, suggesting it will be demolished or moved. 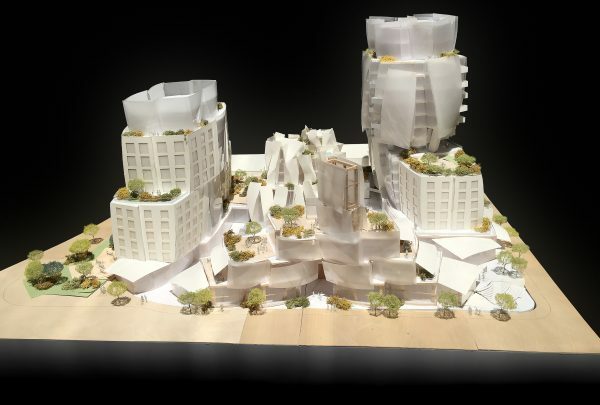 Gehry was brought in to design the 8150 project after residents balked at the more traditional designs and plans initially presented at public meetings. But when Townscape last year unveiled Gehry’s more fanciful vision for the project, featuring the architect’s signature swooping facades, some residents and stakeholders complained that the developer became less open to compromise. Opponents say the project will dwarf nearby buildings, which must follow a 45-foot height limit. One appellant, the owner of a nearby apartment building, called it a “monstrosity” that would negatively affect her property. As many architects of recent eras and previous centuries, some stand the test of time and become timeless. Occasionally there are disrupters who differ from those pushing the limits of refinement. Frank Gehry always has been a disrupter. Will his designs become revered? The Kurt Meyer Lytton has been discerned by many to be an elegant example of modern classicism. The folded roof design is strangely analogous to the shuffled roofline of FOG’s personal residence on Adelaide overlooking Santa Monica Bay. He chose a classic property that unfortunately has an addition that could not be fully dedicated as a landmark and built his concept but retains the Spanish Colonial Chegueresque ornamentation at the entrance. Mr. Gehry just can’t bring himself beyond thinking that Meyer’s accomplishment should become a “memorial plaque”. The true honor would be to again ” borrow” the roofline concept, preserving the Lytton and incorporating it as a design element in the continuous chain of architectural conversation. The question is “Will an obstructionist allow himself this gesture” to a fellow? Lytton Savings was perfect for 1960 – flat, wide, with lots of surface parking. The zigzag roof was there so you could distinguish it from every other flat/wide building on Sunset Blvd. at the time. But the world has moved on, and that building is out of place. The bollards on Havenhurst are a good idea. Sounds like the Weho city council did everything they could. Not a big fan of Frank Gehry’s work. It always looks chaotic. It will however look better than the strip mall that’s currently there so I guess that’s a plus.. Frankly, I like this project because it looks like a 3 year old designed it, perfect for the area. And better than what is there now (except for Lytton Savings). Yes, traffic will get a lot worse for everyone but that seems to be part of the master plan. Oh wait, there actually is no plan. Congratulations to the West Hollywood City Council, you’ve now made it almost impossible to eat anywhere in the city without forking over $100. I wonder how much it cost for Townscape to buy the LA City Council’s lightning-quick approval? I’m not convinced that this project will even use Frank Gehry as the lead architect. His name was used to get fast approval from starchitect-struck politicians. I still want to see the Lytton Savings building saved. It’s an important piece of LA history and a mid-century modern gem. So are we looking at this thing from Sunset Blvd looking south? What is that in the very center? A building? Certainly seems like the Lyton Bldg could be saved since it appears to me in the center of this model and not where any of the towers would be. Why not design it architecturally with a nod to the Garden of Allah? Geez this is hideous looking. Has the center building been flattened by a giant’s foot? ?